Years ago (many years) while in college at RISD I majored in sculpture design and spent most of my time in the wood shop. 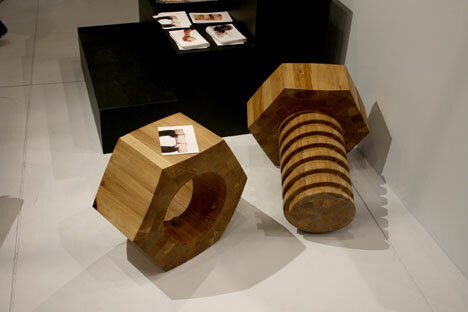 It was set up for furniture design and they had a tap and die set for creating wooden nuts and bolts. I loved it and used it, not for furniture but for my sculptural pursuits. 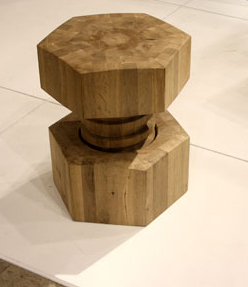 Here Charlie Heyward and Peter Bigham from the Stenby School in Sweden combined furniture with the same concept and designed a Nuts and Bolts stool. I love it. And it does indeed unscrew. It has a wide range of adjustment built in! It is on display at the Stockholm Furniture Fair 2011. My question is how long between showing and commercially available? Many design sites show beautiful work from the furniture fairs but how does one acquire these treasures? Thanks to Core77 for the lead. Side Note: I have just learned that this love of mechanical with creativity is being labeled Geek Chic. I now have a term to describe my style! Check out this ideabook on Houzz. It explains it in detail.